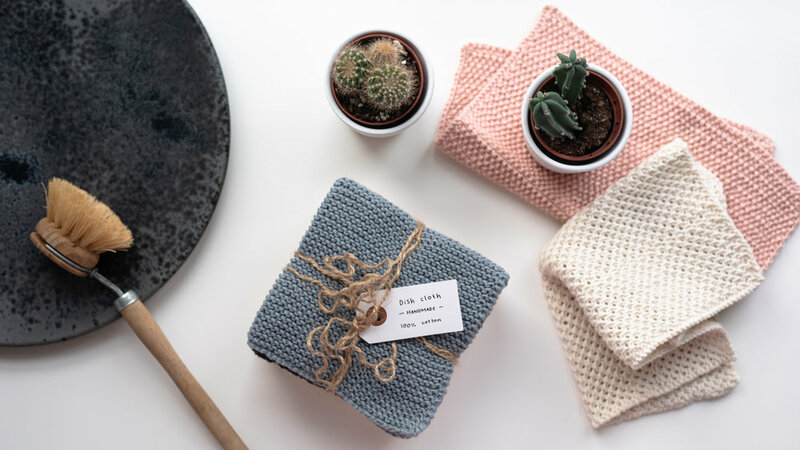 With more and more of the mainstream focus turning toward sustainability, reusable wash cloths are yet another easy way to save paper and avoid using paper towel constantly. Made of 100% cotton, these cloths are a dream to use and afterwards to clean, as they go in the washing machine and dryer. As long as I can remember we have had a couple of these lying next to the sink, ready to dry off the counter or wipe away remnants of working in the kitchen. To make these you will simply need some yarn (i would recommend using cotton) and a pair of knitting needles (mine were 3mm). Cast on 60-80. Depending on the size and stitch you want. Knit until cloth is square. Row 2: *Knit 1, purl 1. Repeat from * across. Row 4: *Purl 1, knit 1. Repeat from * across. I think this project is my favourite of the three, not only because they were surprisingly quick to make (about 45 mins! ), but the design is stunningly simple. 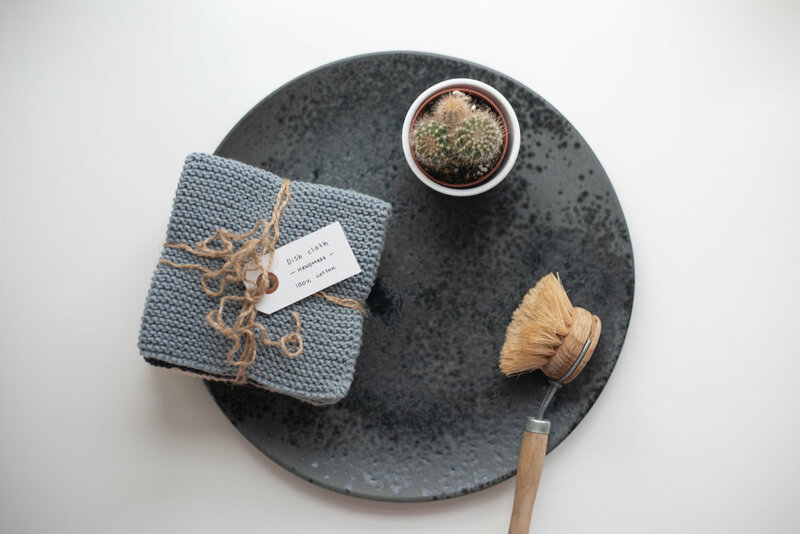 They can be used as potholders, hotplates or decorative pieces in the kitchen, and can be crafted in a variety of ways. The color, crochet stitch and size are all thing you can customise, and adding the strap is also optional. This particular pair I am saving for when I move out myself cause I am completely in love with them. Chain 16 and go back through the second to last chain to create a single crochet. Single crochet back and forth, flipping the piece each time you reach the end of a row. Repeat until square. Finish off and weave remaining loose ends through work. Cut a strip of leather (about 15 cm) cut diagonally at the ends. Gather as shown on picture and poke four holes through both layers in a diamond formation. Sew through crochet piece and the holes in the leather to secure tightly. Cut a strip of fabric that is about 10cm wide and 2.5 times the length of your scrunchie. Mine was about 10x40 cm. Place the fabric right sides facing each other around the elastic and pinch at one end. Start joining the two sides with a simple running stitch around the elastic forming a tube. When you reach the end, feed the tube through itself so the right side of the fabric is facing out, whilst encasing the elastic. Fold the raw edges on each end inwards and stitch together so the fabric is completely sealed around the elastic. That was it for this post, I hope you enjoyed. If the instructions are gibberish try checking out my Youtube video about these crafts. Thanks for reading! Come back soon for more posts and pictures. Click on the images down below to download the templates. They are meant for an A4 size piece of paper. Start by printing the templates onto your paper or drawing the houses yourself. 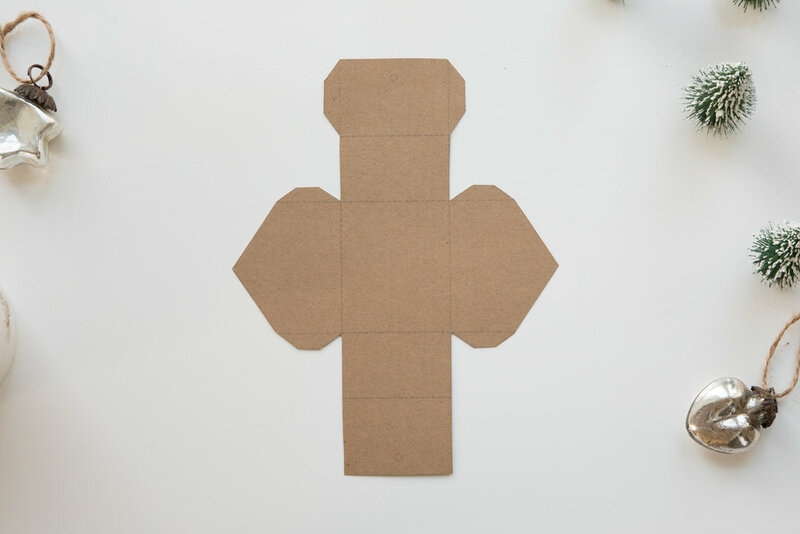 Cut along all the lines on the outside and leave the lines on the inside of the shape uncut. Then score the remaining lines with a sharp edge or dull knife so the paper is not cut but simply easier to fold exactly where we want it to fold. Remember to fold all the part inwards toward the lines so we end up with the visible lines on the inside of the house. 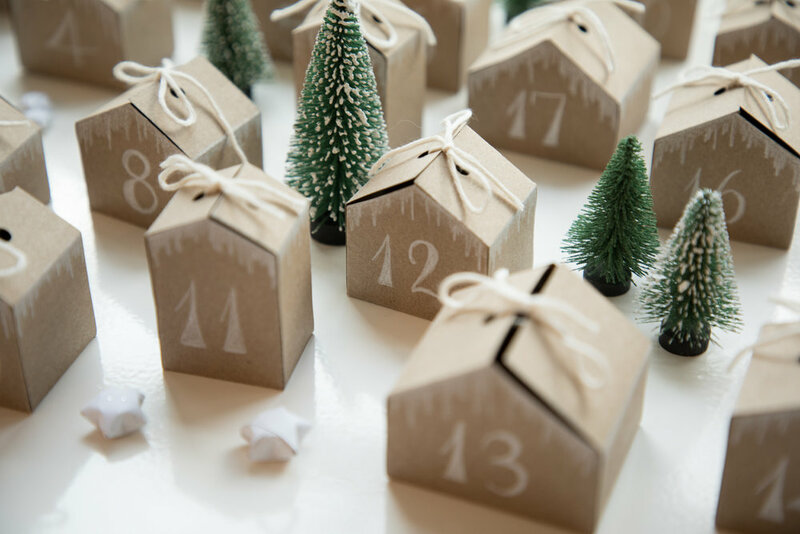 The first arrangement of the advent calendar I'd like to show you is this cute little winter village/landscape. I simply placed all the houses somewhat randomly in a windowsill along with some mini faux pine trees and a few white origami stars that I made from leftover scrappaper. The second display is a regular 40x40 cm canvas on which I hung the paper houses. I just used regular pins and stuck them through at an angle. I paired the canvas with a small bouquet of eucalyptus branches, a paper Christmas star (my next video will be a tutorial on this as well as other diy ornaments), a simple candle with golden feathers and a silver heart ornament. I love the clean and fresh look of this setup. The last option I have for you is hanging all the houses on a string or ribbon with tiny clothing pins. I used a very natural coloured ribbon which I thought complimented the color of both the houses and the pins very well. I hung the arragement over a small table where I had placed this very simple flower and a few candles. 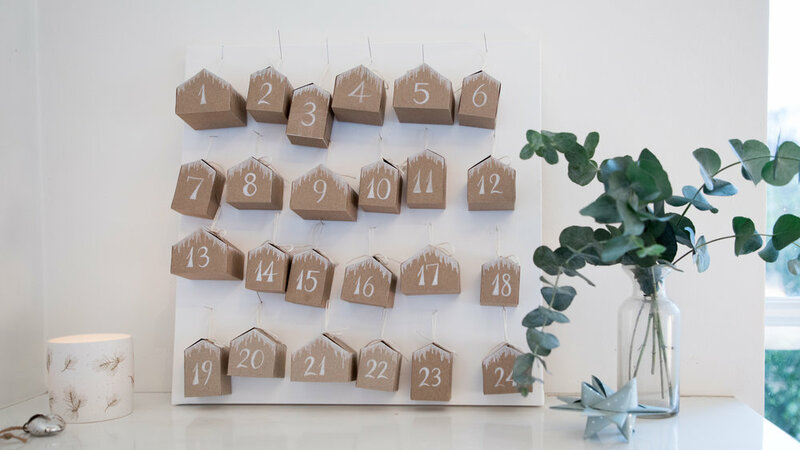 Again, a simple but cute way to place your advent calendar. #1 - Stick to a color scheme. This is one of the more difficult ideas, but also the one with the most benefit. Having a color scheme in your home or just a room, will give it a coheisive and intentional look. Everything will look like it was put there for a reason. I chose a color scheme of about 4-5 colors for my room. I use to monochrome tones, mostly black, dark grey and white, and then I have details in copper and dusty rose (a blanket, a lamp, etc). It looks clean without feeling to clinical. #2 - Choose a style. Another extremely important part of having a coheisive look is choosing a style. Everyone's style is different, and of course you should choose one that matches your aesthetic. That could be anything from bohemian to punk rock. My style is a mix of mininal and vintage. I limit the amount of clothes, books and knick-knacks on display to the bare minimum and instead let one-of-a-kind vintage items take up the space on my shelves. Well, not all of them are actually vintage. my record player for instance is from Urban Outfitters, but it still adds atmosphere; just like my Instax pictures on the wall. #3 - Keep it simple. This is mainly in regards to textures and patterns in your living space. The more different types of textures and patterns you have, the more confusing and busy your space will look. Try to limit yourself to objects with solid colors. If you for example have copper in your color scheme, let all copper elements have the same tone and texture. Of course there are limits to what is possible, but try to the extent that you feel is possible. 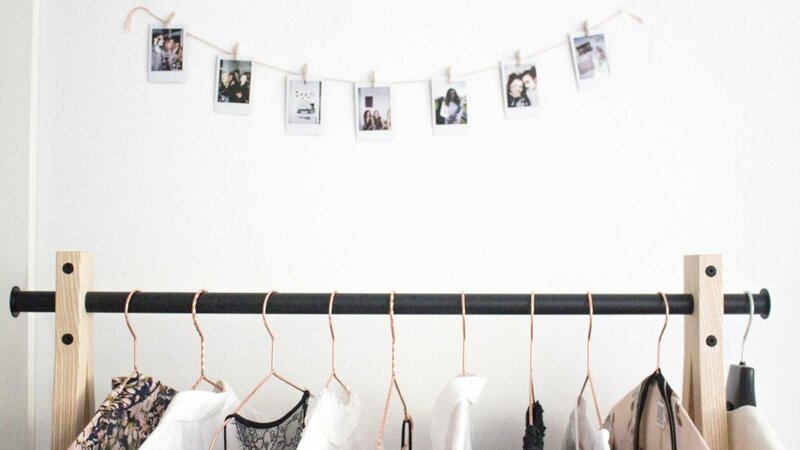 #4 - Display your favorite pieces. Displaying cool and different objects with your aesthetic in mind can be a great way to add personality and interest to your room. Try to experiment with which items look good - you may find some unconventional and fun options! Don't be afraid to place your nicest pair of shoes or empty box on the top shelf. Some of my displayed items include: An antique trumpet, a magazine, my Instax instant cameras, perfume bottles, bags from high-end brands and other items. #5 - Lots of air. Don't be afraid of empty space! I cannot stress this enough. Empty space and white walls are not something that must be eliminated. Having just one item on a shelf is one of my favorite ways to display and store my favorite pieces. This way you give your favorite items the attention they deserve AND lots of light can emerge. This is another way to make your shelves and surfaces look intentionally decorated and clean.